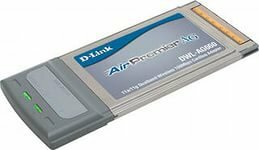 D-Link DWL-AG660 is one of the classic models of the network adapter. This model has a good power of the transmitter, which is 15 dBM, in the presence of an external antenna on 2 dBi. Thus, the range indoors it is 100 meters. Also has good features, positioning model DWL-AG660, you will be always automatically receive a new key at any inclusion, avoiding inconvenient operation manual input the WEP key. Has the full support of 802.11g, 802.11b and 802.11a. The weight of this network adapter only 55 grams.